This is a great short hike, (11 Km ), when first arriving to El Chaltén, that will help you warm up for longer treks in days to come. Just outside of town, the hike takes no more than 2 hours. Considerations: The trails in El Chaltén are all very well marked and only for hiking. If you passion is mountain biking, there are separate options just for you, nearby this trail. Check for details in town. Difficulty: Easy. Great for everyone. 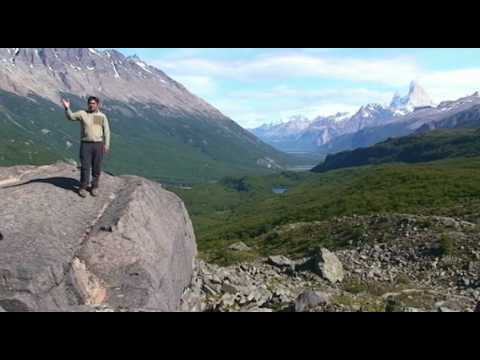 Like many hikes in El Chaltén, you can walk right from your cabaña or hotel to the trail head. Head to the top of the main street, Av. San Martin. Turn right onto the road to Laguna/Lago (Lagoon/Lake) del Desierto. You’ll walk 5 Km on this winding gravel road to reach the trail head. Around the 5 Km mark, you will find a small clearing and a sign marking the Chorrillo del Salto trail. The trail passes through native lenga, (nothofagus pumilio), and ñire, (nothofagus antarcticus), forests, and is well formed from years of hiking. The trail leads uphill alongside the Chorrillos del Salto River (gain of 10 m). It then flattens out for a brief walk, leading you to the Chorrillo de Salto waterfall. The trail is marked with indicators on the trees alongside, and with rock cairns (small piles of rocks) with arrow indicators. This hike is an out and back, returning along the same trail. Depending on time spent at the waterfall, the total hike will take about 2 hours. Put Los Glaciares National Park at the top of your Bucket List and start making plans! Awarded UNESCO?s World Heritage Site designation in 1981, this Park is home to incredible peaks like Fitz Roy and Torres, enormous glaciers, and the aquamarine waters of Viedma Lake.